If a company were able to copyright basic concepts, rather than specific works, Hasbro would be rolling in cash right now. They started the whole "make cute, superdeformed, kid-friendly versions of your properties" thing when they let their Playskool division make Star Wars toys (which eventually spread out to became an entire scale of figures), and then everyone else started copying them: Mattel did it with DC and Toy Story; Mezco did it with Hellboy and horror; Playmates did it with TMNT; Bandai is doing it with Power Rangers; and even Character Options/Charter Ltd. (depending on which side of the Atlantic you live on) are doing it with Scooby-Doo Mystery Mates. We start with the Mummy. He comes from the Scooby Doo, Where Are You! Season 1 episode "Scooby Doo and a Mummy, Too," where the 3,000-year-old mummy Ankha came back to life and was turning those who had disturbed his tomb into stone. The figure is 2⅝" tall, and has no articulation: it's odd, because most of the other figures do, and his bandages would have concealed the swivels. The sculpt on the wrappings is really impressive, with the strands seemingly layered over one another, not just done as lines in an otherwise flat surface. Several loose ends dangle from his arm, shin and the back of his head, and there are a few areas where the skin of the man in the costume (spoiler alert: this isn't a real mummy) shows through. The Mystery Mates were originally sold in two-packs, and most of them came with a Scooby-Doo wearing one ridiculous costume or another. With so many dumb toys available, we're lucky that this set includes a Scoob that's not awful. He's all hunched over to stare at the ground, and he's holding a magnifying glass up to his eye. He has no articulation. This isn't a great offering, but he's not wearing a scuba suit or a caveman smock, so that has to count for something. Next we have the werewolf (yes, surprise, surprise) from episode 11, "A Gaggle of Galloping Ghosts." He's only one of several monsters seen in the episode - including Dracula and Frankenstein - but he is the first to appear. He even shows up before the Scooby Gang rolls in! For whatever reason, the show's designers decided that werewolves have brown hair and pale lavender skin. He has a black nose and a pronounced overbite, though only two fangs are poking out. 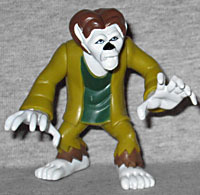 His face, hands and feet are the light purple/gray, his hair and shins are brown, and his clothes are two-tone green. 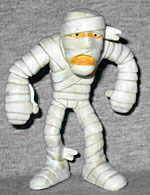 Unlike the mummy, he's articulated: there are swivels at the shoulders. 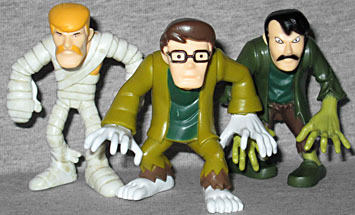 There are two of these five-packs, and while they come with different monsters (the other set has the Creeper, Frankenstein and Dracula), they both come with the same Scooby and Shaggy. That seems like a waste. 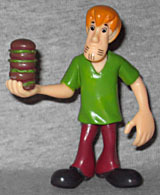 Shaggy's fine - he's unarticulated, but has a simple, cartoony sculpt that gives him feet big enough to keep him standing - but who needs two of him? Maybe if they were different sculpts it'd be one thing, but identical Shaggies are unnecessary. Appropriately, he's holding a giant sandwich, one that appears to be four hamburgers shuffled together. You can expect Scooby to steal it from him any minute now. Our last figure comes from "Which Witch is Which?," the 13th episode. That episode had two villains to unmask - the Witch, and her Zombie servant. Since the episode aired the year after Night of the Living Dead had come out, the Scooby Doo Zombie is an old-fashioned voodoo slave, rather than a (pseudo-)scientific hungry undead. His skin is green, like his jacket and shirt, and his pants are brown. Thanks to the style of the figures, he looks like he's wearing old-man slippers. His eyes are red, and his mouth is open in a moan. Like the Wolfman, he moves at the shoulders. Although these figures share their sculpts with the Mystery Mates, they're not actually part of that line. Rather, they're packaged under the "Trap Time" banner. 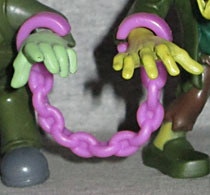 To that end, this particular five figure pack includes a pair of purple manacles. They really only fit on the Zombie, thanks to the pose of the other figures' arms, so they seem rather useless. That's not the important part, though. The set also includes swappable "who dunnit" heads - since the villains on Scooby Doo were always guys in masks (and 90% of the time, the first person the gang met in the episode), these figures all feature removable heads, and replacements that turn them into plain humans. The three heads included in this set don't match the culprits as shown in the cartoon. Well, okay, the head next to the Zombie kind of looks like Dr. Najib, except white (and also, he was the guy posing as the Mummy of Ankha - the Zombie was played by bearded Zeke). And the head by the Mummy looks like a blond Buck Masters. The third head, with the glasses, might be Ace Decade? The heads all have the same shape of neck peg, so they can be swapped around however you like - you can even make a werewolf mummy, if you want! 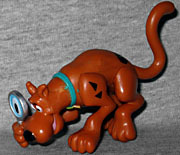 The Scooby-Doo Mystery Mates are, like the other set reviewed this month, a series of toys I never knew existed. I'm glad I didn't, though, because the Trap Time are better iterations of the same thing - not because of the "trap" accessories, but because the Who Dunnit Heads add play value (but they might be a choking hazard for young kids). As before, they're sold in two-packs, but this five-pack is a better value.